Few education policy battles have burned as hot as debate over the practice of requiring traditional public schools to share under-used space with charter schools. Co-location, as the practice is called, is often cited as damaging to students in mainline district schools. But groundbreaking new research from Temple University Assistant Professor Sarah Cordes finds that at least in New York City, the arrival of a charter school has a positive effect on students in the traditional school already located in the building. The first peer-reviewed research released on co-location, the study looked at nearly 900,000 students in grades 3-5 who attended a traditional public school in an attendance zone that included a charter school serving at least one of those grades between 1996 and 2010. Many of the schools studied shared a building with a charter school, something that’s common in cities where real estate is at a premium. Other researchers have asked preliminary questions such as whether co-location facilitates the sharing of innovations birthed in successful charter schools, but Cordes says her research shows that just the existence of an option sparks change. 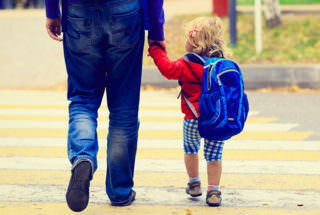 Some 75 percent of kids attend school within a mile of their home. And New York City charter schools must give preference to students living within their attendance zone. The closer a charter school is, the more pressure its opening creates. The closer a charter school is to a traditional public school, the stronger its positive impact. Students attending traditional public schools in buildings that also house a charter school perform 0.083 standard deviations—a statistical measure that allows researchers to make apples-to-apples comparisons—better in math and 0.059 standard deviations better in reading. Students in traditional schools located up to half a mile from the nearest charter school perform 0.021 standard deviations higher in math and 0.020 higher in reading. To put that in perspective, research on class size indicates that being in a small class increases test scores by as much as 0.2 standard deviations. The co-location study suggests that being close to a charter school increases student performance between 1/10 to 2/5 as much as being in a small class. The study found small upticks in student attendance at traditional schools as well as a 20 to 40 percent drop in the number of students held back for not performing at grade level. Students in traditional public schools that share buildings with charters are half as likely to be retained—not advanced to the next grade—than those in traditional schools located further from a charter. Cordes found that demographic changes in schools do not account for the increases in performance. Impoverished students and children with disabilities do as well or better when a charter school locates nearby or in their building. Her findings also disprove a common accusation that charters leave nearby traditional public schools with a disproportionate share of the neediest students. In fact, Cordes found that when a charter opens nearby, special education students leave traditional schools at the same rate as their nondisabled peers. Contrary to popular belief, which holds that charter schools siphon off the highest-performing students and those with the most motivated parents, Cordes found that families in traditional schools in co-locations report higher levels of engagement and safety. Teachers report higher academic expectations and more respect and cleanliness. Other possible factors include the space-sharing plans charter schools wishing to co-locate must come up with, which could make the entire building more orderly and a rule dictating that improvements made to the facility by a charter school must extend to the entire building, Cordes notes. Traditional public schools sharing a building see an increase of almost 9 percent in the amount spent on instruction per pupil—likely because of the aforementioned dip in enrollment. Traditional schools within a half mile of a charter see an increase of 4.4. percent, with schools located within a mile experiencing a 2 percent bump. Cordes offers a caveat: Per-pupil spending on instruction goes up when student-teacher ratios fall. But depending on how a school is staffed, that doesn’t always mean smaller class sizes. Overall, “spillover effects” are significantly greater when the traditional school is within half a mile from a high-quality charter school, defined as one whose students on average perform at or above the 75th percentile citywide. The charter school’s quality matters less, however, when the programs are co-located. The results beg big questions. The factors driving the positive changes require much more study, and Cordes is anxious to learn whether the impact is the same in cities such as Los Angeles and Philadelphia, where a much higher percentage of students attend the jointly housed schools. But the findings of the new study suggest that New York could benefit from more charters, and in particular new programs housed alongside their traditional counterparts. This article was published in partnership with The74million.org.